The Spa at Encore Macau is an opulent place to unwind from the busy streets of Macau. From the calming reception area to the large private treatment suites, lavish water facilities, high-end skincare products and delicious tea and fruit refreshments, every spa journey is a profoundly relaxing and cosseting experience. The spa offers everything from anti-aging facials to ginseng hot stone massages to traditional Chinese treatments that will help you get your qi back. There are just eight treatment rooms, but what rooms they are: each has their own steam room, sauna and aromatherapy showers. Taking a break from your everyday stress is easy to do inside of this luxurious facility. 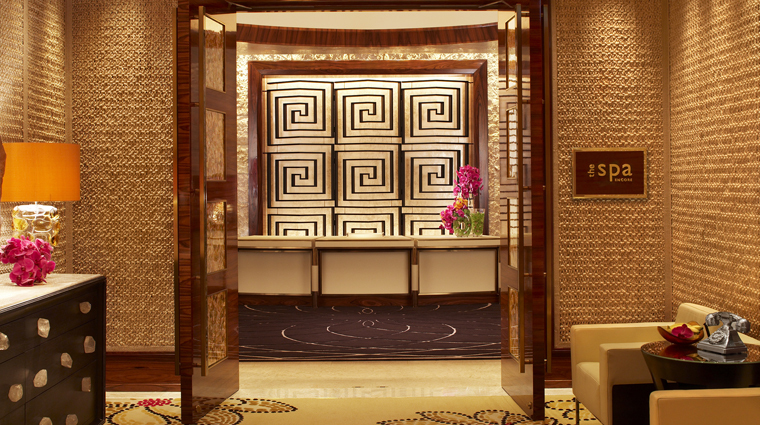 From the moment you step off the elevators, the exclusive luxury of Encore Macau makes an impression. The hushed reception area, with its energy-cleansing crystals, creates an instantly calming vibe. You'll never want to leave your therapy suite, which comes with a steam room, sauna, hydrotherapy aroma bath and relaxation lounge. Therapists at this luxury spa are top-notch, and the treatments are expertly performed using an array of leading skincare brands. Short for “Do Not Age,” the spa’s 90-minute DNA facial features a refreshing mix of creams specifically designed to help combat unwelcome wrinkles and other signs of aging. We can’t say we came out looking 10 years younger afterwards, but our skin certainly felt smoother and rejuvenated. On our most recent visit, we were served a large plate with fruit and offered a choice of two flavorful fresh fruit juices — and we admit to sticking our hand in the cookie jar one last time, too. The spa suggests booking in advance so that it can be sure to accommodate your preferred time. The Spa at Encore Macau prohibits the use of cell phones in the facilities. Guests staying at Encore Macau can opt to have a spa treatment in their hotel room for an extra charge. Because four hands are better than two, the Double Happiness massage given by two therapists is the top choice for serious muscle pain. You’re guaranteed to feel twice as relaxed afterward. More exotic treatments include the Aroma Stone massage, which uses volcanic hot stones and essential oils to soothe and get rid of your tension. The East West massage uses acupressure and a blend of lavender, ylang ylang and ho wood oils. If you need to get your Qi moving, there’s the Tui Na oil-free deep massage and the Ho Guan, which uses cupping on vital acupressure points. Men will be delighted to know that they can visit Encore Macau’s oasis and receive five specialized facial treatments that have been designed just for them. The facials offered include a hydrating, detoxifying, brightening, express or black diamond treatment. Your therapist will lead you to your treatment suite, each of which is its own sanctuary-within-a-sanctuary of three rooms decorated in luxurious wood, mother-of-pearl, bronze, marble and leather. The first room is a circular private relaxation lounge, a calming cocoon where you rest, sip tea and change. Next is the heat experience room, which includes a steam shower, sauna and aromatic hydrotherapy bath, and finally there’s the treatment area with its dimmed lighting and candle-lit wall feature.